With their quadrennial General Assembly approaching, officials from Sunday School & Discipleship Ministries International (SDMI) at the Nazarene Global Ministry Center in Lenexa, Kansas, were looking for a giveaway that would be memorable, but not break the bank. They wanted to draw attention to the church’s mission – which, in a word, is discipleship – and they were searching for a tangible reminder they could give to General Assembly attendees visiting their booth. They wanted a token that would make people think “discipleship” each time they saw it. While it had to be memorable and effective, the memento also had to fit into a tight budget. Custom coins answered the call on all counts. SDMI spokesperson Kathy Lewis recalls the planning sessions leading up to the General Assembly. Committee members all agreed that whatever they were to give away had to be memorable, not mundane. They wanted a giveaway that would be portable so that it could serve as a constant reminder of their mission. When Dr. Woodie Stevens, SDMI director, suggested the idea of custom coins, it was an “AHA” moment. Because the coins are meant to be carried around with “pocket change,” they are seen each time a person feeds a parking meter, buys a soda or a pack of gum, or any of a hundred other times they might reach into their pockets during the course of a normal day. That visibility – and the economies of buying them in bulk – made custom coins a perfect choice. As it turns out, the coins were ideal for the General Assembly – but also for other uses as well. Once the SDMI committee settled on the idea of custom coins, an online search pointed Lewis in the direction of Osborne Coinage Company – a Cincinnati company that has been minting coins since Abraham Lincoln was president. Working with Osborne reps, the SDMI planning committee selected an aluminum coin with a 39 mm (1-1/2”) diameter and 15 gauge thickness. That sizing allows ample room so that the message is legible and easily read. Aluminum is easy on the budget, so even with two different designs on the SDMI coins, the project was still “very affordable,” according to Lewis. The Nazarene SDMI planning committee opted for two different designs, both of which were used for the same purpose – to serve as a discipleship reminder. 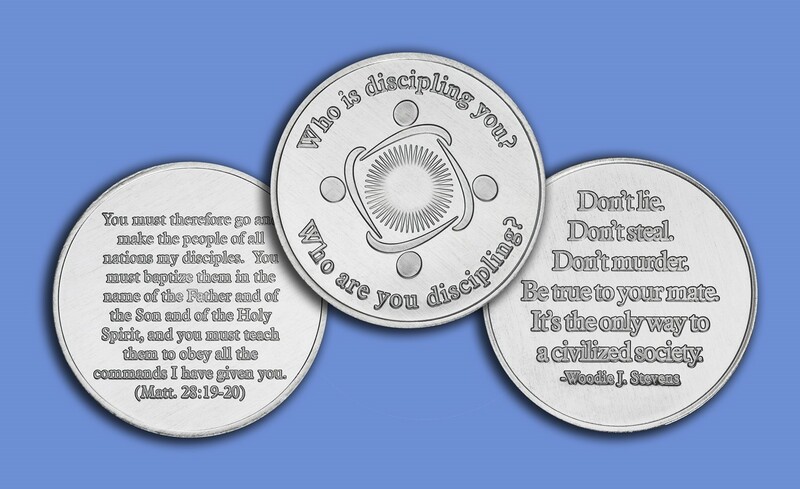 Both versions include “Who are you Discipling?” and “Who is Discipling You?” on one side, along with the SDMI logo. The first version minted includes the Great Commission (from Mathew 28:19-20) on the other side. The other version includes a favorite personal quote of Dr. Stevens on the other side. Both versions are a big hit and have since been re-ordered. In total, more than 8,000 coins were distributed during the five-day event. But the success of the program didn’t end when the show ended. Once the staff of SDMI arrived back at their Lenexa, Kansas, offices, they advised district Sunday School chair-people that the coins were available. “Several of the districts bought coins from us,” said Lewis. In addition, the coins are also being used with other meetings and conferences. SDMI used over 300 coins at an October conference in Willow Valley, Pennsylvania. And Lewis had over 500 attendees at a January District Leadership Conference in Louisville, Kentucky, where SDMI staff gave coins to each attendee. Discipleship and evangelism are very important to the International Church of the Nazarene, where the denominational theme is “Make Christ-like Disciples in the Nations.” Dr. Stevens and the staff of Sunday School & Discipleship Ministries International would agree that this should be “top of mind” for them. Thanks to these new custom coins, that is being realized. When people see an SDMI custom coin in their pocket change, they are reminded that discipleship and evangelism do not take place just on Sundays or solely from the pulpit. Rather, discipleship and evangelism opportunities arise virtually anywhere in the real world. Thanks to these new custom coins, Nazarenes around the world are constantly reminded of this fact; and when an opportunity arises, they are prepared to capitalize on it.